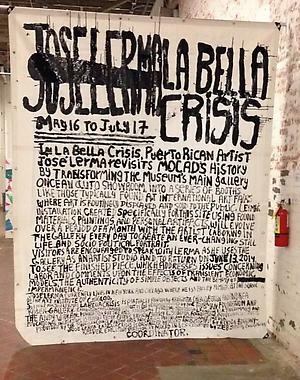 In La Bella Crisis, José Lerma revisits MOCAD's history by transforming the museum's main gallery, once an auto showroom, into a series of booths like those typically found at international art fairs, where art is routinely displayed and sold to the public. Lerma’s installation, created specifically for this site using found materials, paintings, and personal artifacts, will evolve over the period of a month with the artist laboring in the gallery every day to create an ever-changing still life and socio-political portrait. Visitors are encouraged to speak with Lerma while he uses the gallery as an artist studio and to return on June 13 to see the finished piece, which addresses issues concerning labor and comments upon the effects of transient economic models, the authenticity of simple objects, and the beauty of impermanence.